Come create an exciting new memory that lasts a lifetime aboard the ‘Sashimi.’ We offer fishing charters on beautiful Long Island Sound, sailing out of historic Northport harbor. Northport Fishing Charters caters towards custom fishing adventures. “Long Island Striped Bass fishing & Fluke fishing at it’s best!” We fish for most species in season. Also, we can accommodate small groups for clients, birthdays, sunset cruises, and family outings. Check Our New 36′ Boat – here! Looking for that special 6 pack fishing charter or a unique vessel that can handle more than 6 people? Northport Charters is proud to introduce our **New 36’ Calvin Beal Maine Custom built Down-Easter** We can now accommodate 1 to 14 passengers. Give us a call @ 631-707-3266 or email us here for details & reservations! 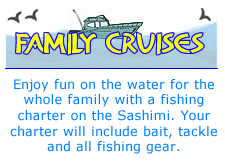 We can make your fishing dreams a reality on ‘Sashimi!’ Call today! Whatever your needs, we will work closely with you to make your experience on the ‘Sashimi’ a long-lasting memory of a lifetime. 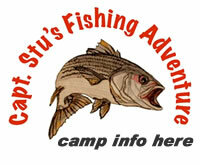 Book fishing charters and make your reservation at 631-707-3266 or use our email form here. Come create an exciting new memory that lasts a lifetime aboard the ‘Sashimi.’ We offer fishing charters on beautiful Long Island Sound, sailing out of historic Northport harbor. Northport Fishing Charters caters towards custom fishing adventures. 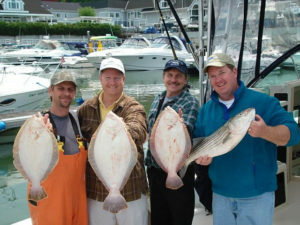 “Long Island Striped Bass fishing & Fluke fishing at it’s best!” We fish for most species in season. Also, we can accommodate small groups for clients, birthdays, sunset cruises, and family outings. Check Our New 36′ Boat – here! Looking for that special 6 pack fishing charter or a unique vessel that can handle more than 6 people? Northport Charters is proud to introduce our **New 36’ Calvin Beal Maine Custom built Down-Easter** We can now accommodate 1 to 14 passengers. Give us a call @ 631-707-3266 or email us here for details & reservations! We can make your fishing dreams a reality on ‘Sashimi!’ Call today! Whatever your needs, we will work closely with you to make your experience on the ‘Sashimi’ a long-lasting memory of a lifetime. Book fishing charters and make your reservation at 631-707-3266 or use our email form here.